Tableau 9.1 gives you more ways to answer questions with your data with a new mobile experience, new options for connecting to data, features that make user management easier, support for additional enterprise security and authentication options, and more. Get ready to analyze all of your web data with the new Web Data Connector. Connect to Google sheets, Facebook data, and enterprise web services. A Tableau web data connector gives you a way to connect to data that doesn't already have a connector. Using a web data connector, you can create and use a connection to almost any data that is accessible over HTTP. This can include internal web services, JSON data, XML data, REST APIs, and many other sources. Because you control how the data is fetched, you can even combine data from multiple sources. 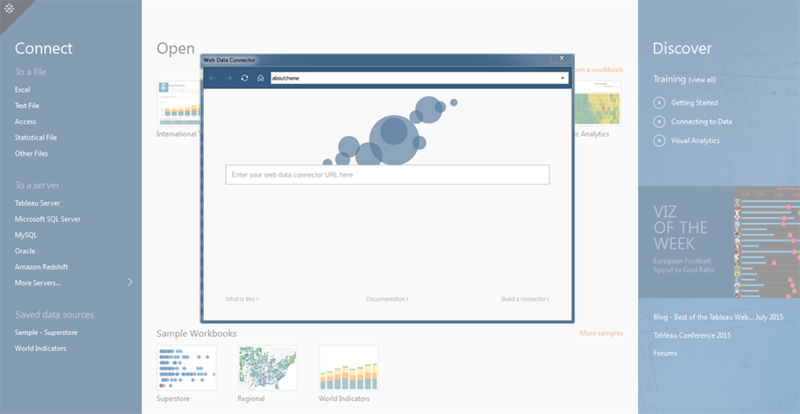 With SDK you can create and use Tableau Data Extracts across Tableau Desktop, Online, and Server. And that's not all, you can now quickly connect to Amazon Aurora, Google Cloud SQL, Microsoft Azure and SAP. Tableau Mobile is the fastest, most delightful way to stay on top of your data. Go from question to insight in just a few taps with Tableau Mobile's streamlined experience. Select, filter, and drill down with a tap of your finger. Interact with your data using controls that are automatically optimized for touch even when you're not connected. Tap to add calculations and filters. Use Show Me to suggest different views of the data. Ask entirely new questions using Tableau Mobile's powerful editing capabilities. Our apps fit into your security ecosystem with support for SAML and Active Directory. Easy enterprise deployments with flexible authentication for your security ecosystem. 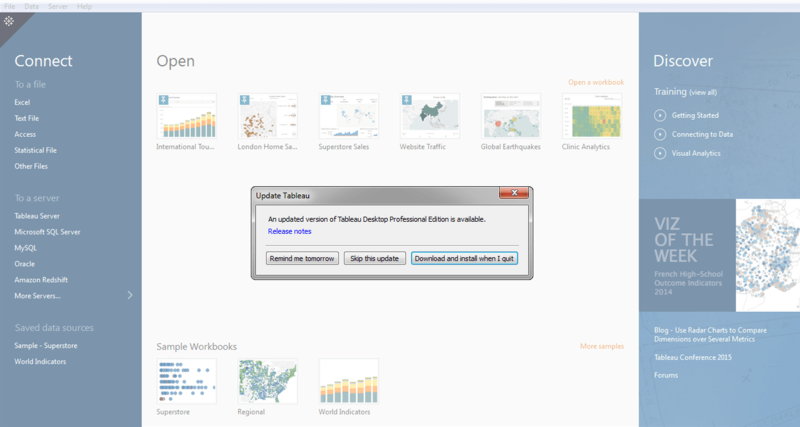 Product Update ensures users have the latest maintenance release of Tableau Desktop, helping your organization stay secure. Active Directory Synchronization updates Tableau Server with your latest AD groups settings. 9.1 Offers a secure and automatic Tableau Server sign-in experience across devices with SSL Client Certificates and Mutual SSL. It also complies with Sarbanes-Oxley SSO requirements using SAML Logout for Tableau Server. Just when you thought it couldn't improve, we made it better with a view proximity in the radial selection tool, pan and zoom control, and more. Now smart histograms allow you to quickly dial into the right bin size with smart suggestions based on your data. The calculation editor in dialogs makes it simple for you to create filter formulas with auto-complete, syntax highlighting and validation support.